During the last few weeks, I have been once again wading through Charles Burney’s magisterial book entitled Music, Men and Manners in France and Italy, 1770. It describes his journey in great detail and his meetings with the rich and famous, though I have to admit that the book can sometimes be a bit heavy going, especially when the author feels compelled to list all the objets d’arts in some rural church. The main purpose of his journey was to gather material for his more famous volume A General History of Music, published in London in 1789. If these things interest you, it’s possible to download the entire book from various web-sites. However, it’s even heavier going than its predecessor and would require considerable perseverance to plod through its eight hundred pages with their rambling and long-winded footnotes. Burney of course was not the first – or last – to travel through France and Italy in search of the arts. Since about 1600, these countries had been on the itinerary of that educational rite of passage The Grand Tour, the traditional trek through Europe undertaken by upper class European young men of sufficient wealth and social status. The tour could take months or even years. Italy was invariably the final destination and Rome had been the goal of pilgrims for centuries. Italy was not only the destination but the inspiration, and no Grand Tour would be complete without an extended stay in the country. At the age of twenty, Felix Mendelssohn did just that. The composer had been a child prodigy and by the time of his two-year Italian journey he was already a successful composer. Mendelssohn found everything in Italy was “the supreme joy in life” and spent part of his time there working on a symphony inspired by what he saw and heard. From Rome, he wrote to his sister, “The Italian symphony is making great progress. It will be the jolliest piece I have ever done, especially the last movement.” He also made some sketches and some water-colour paintings, for Mendelssohn was also a pretty good amateur artist. The symphony was completed back home in Germany in 1833 after the composer received a convenient commission from the London Philharmonic Society. During the course of his short life, Mendelssohn visited Britain ten times and made a significant impact on British musical society. The so-called Italian Symphony was first performed in London in May 1833 and was conducted by the composer. It was an instant success and the sparkling opening, with its initial explosion of sound and its lively melody over quickly repeated chords must have captivated the audience. The work is written in the usual four movements and exudes the graceful charm and lightness of touch that typifies Mendelssohn’s music. The second movement (at 11:10) begins with a relaxed melody over a plodding bass and reflects images of religious processions he must have seen in Rome. The third movement is a delightful minuet, although the form must have seemed a bit old-fashioned by the 1830s. The bustling Finale (at 23:04) returns to the energetic spirits of the first movement and the music is based on the Neapolitan dance known as the saltarello. Mendelssohn keeps the energy driving along throughout the entire movement. Incidentally, when Mendelssohn became the conductor of the famous Leipzig Gewandhaus Orchestra in 1835, he introduced a series of “historical concerts” which consisted of music by well-known but deceased composers – a distinctly novel idea at the time. He would have been bemused to discover that almost all orchestral concerts today are historical concerts. Elgar’s picture of Italy opens in the same boisterous manner as does Mendelssohn’s but in the musical language of the dawning twentieth century. 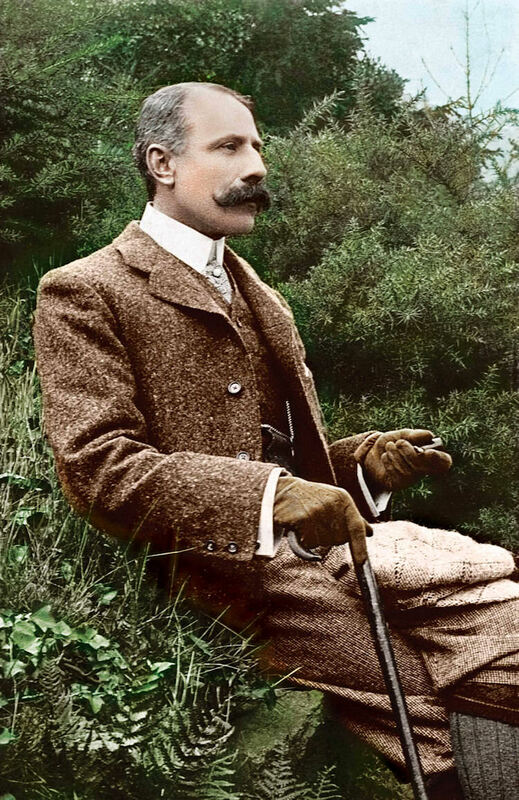 By 1903, Elgar was making enough money to afford a winter holiday in the fashionable Italian town of Alassio on the Italian Riviera, only about fifty miles from the French border. After many strolls in the hills and old towns of the Mediterranean day-dreaming about Italy’s colourful history Elgar wrote, “Then I woke up and found I’d composed an overture. The rest was merely writing it down.” How easy he makes it sound! The work was given its first performance by the Hallé Orchestra conducted by the composer in March 1904, on the third day of an “Elgar Festival” at the Royal Opera House in London. It’s a heart-warming, majestic work filled with rich colours and some surprisingly modern-sounding harmonies. There are many lyrical moments too (listen to the lovely viola solo at 10:40) which serve as a reminder that Elgar was always a dab hand at turning out a jolly good tune.